← Venice, Copenhagen and an idea I have had in mind for a bit! An international Blog Tour organized by Consortium Cesenatico Bellavita. Many international travel bloggers, some of whom arrived for the occasion from the other side of the world came to discover an unusual and alternative Cesenatico. especially when, at sunset, everything turns pink and the moon rises from the sea to allow very unique pictures. When evening falls on the pier, especially in the spring, it creates the perfect atmosphere for romantic or simply quiet walks. Our accommodation was at the top to Sport Hotel – Valverde by Ricci Hotels. After our experience of last year at the Valverde Hotel, we always like Ricci hotels, It was a good guarantee for our stay at #cesenaticobellavita. The location is perfect and the hotel is equipped with every comfort. Cesenatico is not only relaxing, but it’s also cultural. The Maritime Museum is an interesting place for young and old. There are many workshops that are organized in order for children to discover the beauty of sailing and the history of the place. Inside the museum are diverse objects related to the sea. This connection between the sea and the land feels strong even today. Come and walk up here to discover the history of this installation. It’s very interesting. But the culture and the traditions don’t end there. The picturesque Piazza delle “conserve” is a lovely historical place. The small periodic market “zero kilometer”, allows you to purchase the local specialties directly from the manufacturers. Did you know that there are local producers of cheese from Sardinia? They will be happy to tell you their history directly. I can assure you that the cheeses are delicious! Not only the cheeses! We really tasted everything. The strawberries were delicious and we found a bottle of wine called “Cagnina”, This is my husband surname and the wine. Of course we also bought the wine! Since we’re talking about food … here’s a pictures of our apericena! To simply say that everything was delicious and top class, it isn’t enough. What do you think food bloggers? Of course to be good, food doesn’t necessarily have to be the most refined. This was our lunch at the Maritime Museum. The quality is always excellent. A little walk (or with cycle – every hotel give you one) at the Porto Canale, heart of Cesenatico, is lovely. Here you can see the fishing , the main activity of the past, but still important today, flanked of course by tourism. The fishermen along the banks tell us that the clams are still profitable in a market that has been stopped by many negative factors including the economic crisis and the impoverishment of the sea. It ‘s interesting to walk around the harbor and admire the fishing boats. The oldest methods remain the most fascinating. It ‘s easy to be bewitched the movement of the nets which create a very special scenic effect. We’re not alone. All take home these beautiful pictures! We continue our walk towards the area opposite side of the canal. We discover that Cesenatico is also art. The most interesting are the perfectly restored old boats. Some of them are part of the Maritime Museum, while others go out to sea once a year to traditional festival. Ehmmm… no. This year, two time! On sunny days, the sails are fascinating. Even better is boarding these boats and having the opportunity to go to sea. The weather was kind and all the international travel bloggers, divided into two groups, had this opportunity. Fantastic! Some also did something more … thanks to the kindness typical of Romagna, we asked and they gave us a second tour in a smallest boat! Valeria didn’t want to get off! But we didn’t have the nerve to ask for a third tour! Obviously #CesenaticoBellavita was social. What do all these travel bloggers do otherwise? some of them arrived from far away like California, New Zealand, Hawaii and many other places around the world? All perpetually focused on their devices to bring the experience on the web and try to broadcast the emotions experienced live to the world. This is the pictures of second group taken directly from our second tour! There is a true paradise nearby for photographers and naturalists. 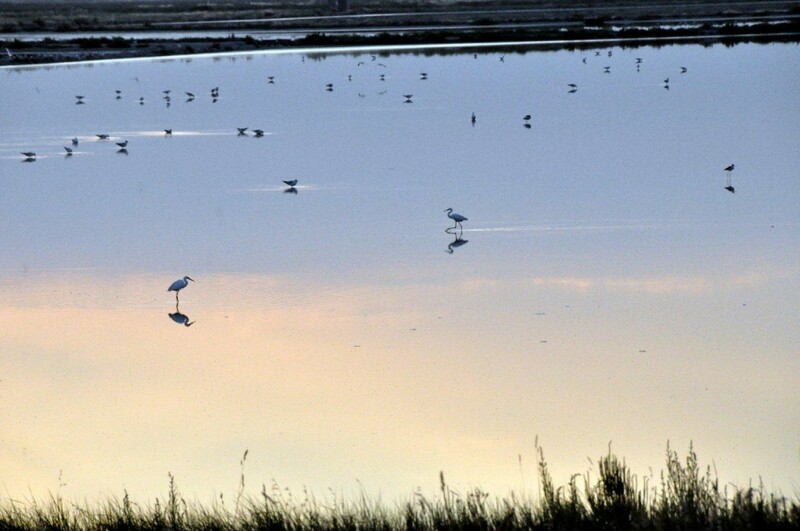 The Saline of Cervia. This is a silent place where you can find the many animals and birds that inhabit this very particular ecosystem, even the beautiful flamingos… sometimes. However, remember to arrange the visit in advance and arrange all details, otherwise you’ll miss the excursion by boat through the salt marshes. We unfortunately couldn’t do this excursion because we didn’t make a reservation (and there is no flexibility if you do not). I strongly recommend you visit this place. These pictures at sunset explain well the place! On the sea with old boat at Cesenatico Bellavita. This entry was posted in Emilia Romagna, Italy and tagged barca @en, beach @en, bird @en, boat @en, campagna @en, dormire @en, entertainment, excursion @en, holiday @en, hotel @en, nature @en, relax @en, sea @en, vacanze @en. Bookmark the permalink.